Twenty Two Courtney represents modern village living on the fringe of the city. Infused with the luxury of abundantly green outdoor spaces, these apartments exemplify the ultimate relaxing lifestyle. Twenty Two Courtney is home to fifty exclusive apartments available in 1, 2 and 3 bedroom layouts. Nestled along a quiet, gumtree-lined street in the well-connected suburb of North Melbourne, the project has fast become a highly sought-after opportunity. The development’s exterior is purposefully inspired by the local context to lend it an overall appearance that is in keeping with the neighbourhood. According to Twenty Two’s architect, John Armsby, “The building has a flavour and feel that complements the heritage buildings that surround it.” With prominent features of both red brick and black window frames, North Melbourne’s industrial feel has truly been drawn into the design. Twenty Two Courtney's spacious apartments are filled with natural light through clever internal light wells, creating green aspects to both the inside and outside of the building. Step inside and you’ll find the interiors awash with modern metallic elements and grey and white hues. With an ability to span both traditional and contemporary aesthetics, this natural palette is ready for you to make your mark. In the bedroom, plush carpet made of 100% wool and delicate drapes create an indulgent personal space and maintain the home’s natural palette. Both the bedroom and the living room open out onto private internal courtyards or vertical gardens at the heart and perimeters of the building. 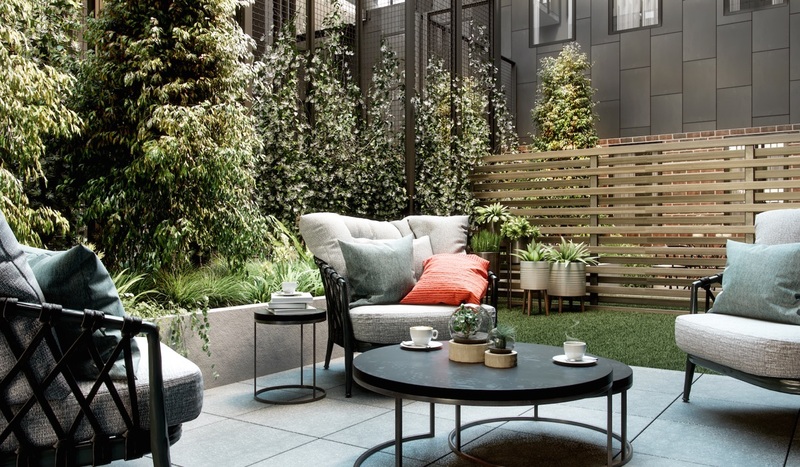 Suffused with greenery to create a sense of being immersed in a secluded nature retreat, these secret gardens bring the best of outer-suburban living to the urban edges of the city. Miele appliances feature in the kitchen as well as stone benchtops, porcelain tile splashbacks and deep bronze tapware, resulting in a modern and polished finish. 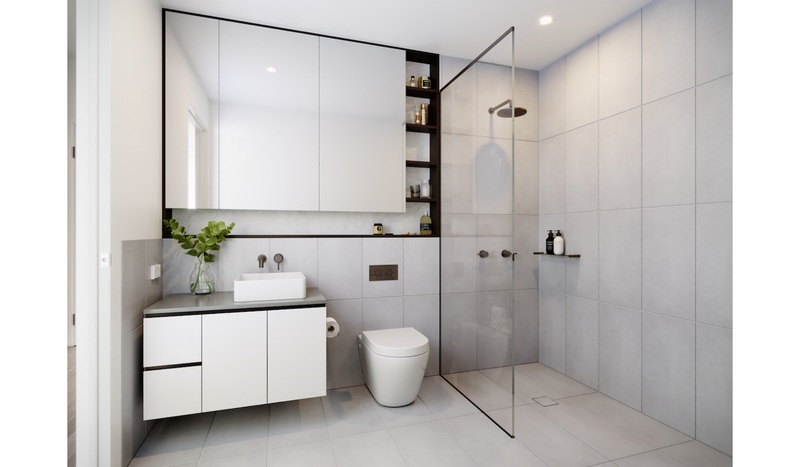 Step into the bathroom and a similar sense of clean, considered design can be found, embellished with recessed shelving for added texture and convenient storage. Unwind after work on the expansive rooftop, complete with sweeping city views, a herb garden and BBQ facilities. Taking the spotlight in the project, this idyllic setting for relaxing alone (or perhaps with a neighbour or two) or entertaining friends and family is a rare luxury, particularly being so close to the city. 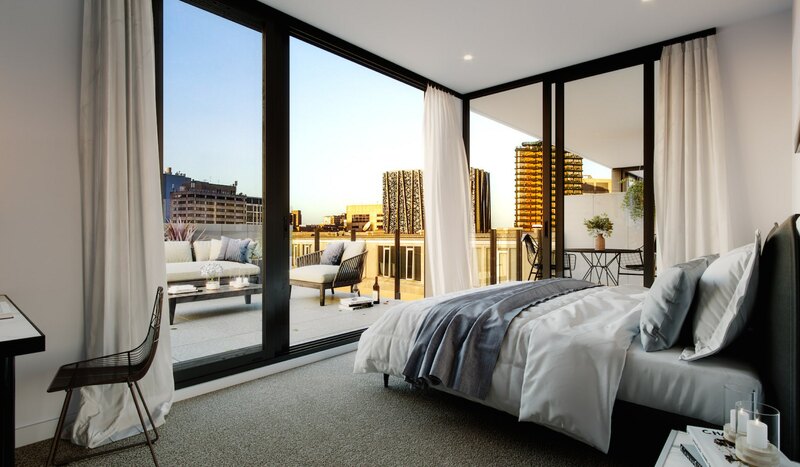 North Melbourne is well-regarded for offering all the conveniences of suburban life with the proximity of city living. Hotspot cafes, trendy bars and cultural landmarks become your playground living at Twenty Two Courtney. And if it’s actual playgrounds you’re after, the proximity to Flagstaff Gardens, Royal Park and Carlton Gardens will give you plenty of options for enjoying an afternoon outside in the fresh air. With abundant tram routes including the 19, 55, 57 and 59, as well as the forthcoming Arden train station, transport in this area is a breeze. 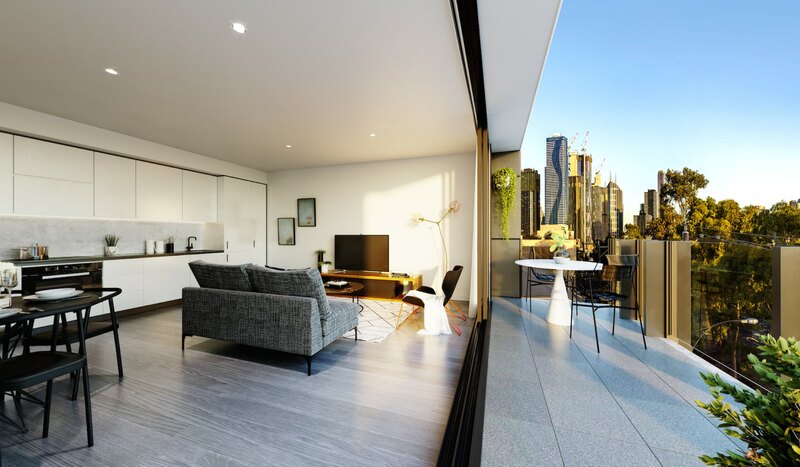 Apartments start from $480,000 and the display suite is open now by appointment at 22 Courtney Street. Craft your own North Melbourne story. Enquire about Twenty Two Courtney today.